Over the last couple of weeks, Letha and I have had several opportunities to spend time with a variety of friends. These were mostly casual settings – enjoying a meal with another couple, gathering at the church for some fellowship or just spending a couple of hours talking with some guys. The thing is, these events were strategically planned. The calendar over this span has been typically busy, we just decided to make it a priority to be around more people in more settings. Sounds kind of sad, doesn’t it? We have to be purposeful and intentional about spending time with friends. But that’s the point. Until we made the decision to do so, our time with other people had taken a back seat to the demands of life. And we were paying for it. I tell people all the time that we were not created to do life alone, that isolation leads to disaster. If you are a leader, you are probably going to have to schedule in some friend time. Look ahead now and plan something. Meet someone for coffee. Plan a meal together with a neighbor. Invite a new family at church over for dinner. It feels really good to be making more friends, getting to know some old friends better. Give it a shot – intentionally. In the last few weeks I have started this blog and also made the switch to an iPhone. Admittedly, I am a slow adapter when it comes to tech but surprisingly, I am having fun. When I do finally take the leap, it is usually because of pressure put on me by friends and family. I get tired of people making fun of me just because my phone is the size of a shoebox. My daughter, Jessica told me that I am now edging toward being cool. That’s what I want to be . . . cool. But she also is one who is always bugging me, wanting me to text message back and forth. What does she know? Everyone knows that texting will never catch on! I gotta go. If you need me, I’ll be at my typewriter and on my land line phone. Critics: Ya gotta love ‘em! So, be encouraged. If you are being criticized, you must be doing something right! Don’t get too caught up with those who tear you down. These are not the people who are changing the world for the better. In fact, many of them have no greater calling in life than to hold others back. You, however, have the call to change the world! I am getting stoked about our next missions project. If all of our plans work out, this summer (June 29-July 5) some friends and I will be traveling back to Central America to serve two orphanages. 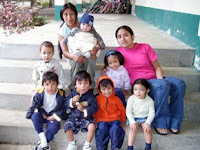 We plan to visit New Life Nicaragua in Managua and Casa Shalom in Guatemala City: casashalom.net. I wish the trip was tomorrow. These trips help keep me focused on the important things. These babies born in adverse conditions are our chance to express love. It is amazing, although these kids have been abused and neglected, they are very receptive to our care and a little effort on our part makes a HUGE difference for them. It is simply a great way to serve and hopefully change the future for at least one child. This won’t be a vacation. It won’t be a sightseeing tour. It won’t be a chance to be a hero. It will be a chance to be a servant. If you have interest in making a trip to Nicaragua and Guatemala, contact me. Somebody has to step up. There are too many hungry kids in the world. There are too many people dying because of a lack of clean water. Too many people lacking basic health care. Who is going to address the problems the people in our world are facing? With all the talk about showing the love of God to people, do we think that maybe Christians could do something? Should the church be more outspoken, more energized toward action? All of this points us to popular culture, and many of its leading faces and voices that have decided to use their celebrity, wealth and influence to engage those who value their creativity so that the plights of orphans, AIDS patients, the victims of the Darfur crisis, the homeless, the hungry, etc., are no longer ignored or forgotten. It has been especially true of the Church in America over the last quarter century that we have not been nearly as engaged in changing the fortunes of the socially marginalized as scripture calls us to be, but many of the key figures of popular culture (musicians, actors, artists, and athletes) have drawn significant attention to these unfortunate groups. Beyond the attention they have been able to create, they have also created significant momentum and action on behalf of various social action initiatives. The Church, especially the evangelical segment of the Church in America, can no longer sit on the periphery of these issues and the initiatives that seek to solve them. To do so any longer not only lessens our missional opportunities, but also shows popular culture we do not believe the totality of all we say our faith is about and built upon, especially the specific words of Christ. Maybe we can stop waiting for someone else to do something. Maybe we can step up and make a difference. One person at a time. A wonderful lady and member of our church just passed away. She has been sick for some time with cancer. I went to visit her again the day before she died, to say goodbye and to comfort her family. As a pastor, I have had the privilege of these experiences several times, but this one was a little different. When I got to her home, especially her room, it just seemed beautiful. There was a lot of peace there. I was reminded of a scripture and shared it with one of her daughters: Psalms 116:15 The death of one that belongs to the Lord is precious in his sight. (NCV) This entire process, though painful, is precious. It is precious because God loves her so much and precious because He is taking her home. She was a woman of grace. She lived her life with dignity. She died the same way. Although she never said a word the morning I was there, while we were praying and worshipping, she lifted her hands in praise to God and wore a big smile. She is now in the presence of God. Beautiful!